JA Europe is organising the European finale of the Sci-Tech Challenge in cooperation with ExxonMobil. For the eight consecutive year, the Sci-Tech Challenge aims to encourage students, aged 15-18, to consider Science, Technology, Engineering & Math (STEM) oriented careers, raise awareness of the importance of STEM skills and how these can be applied in enterprising ways to tackle the challenges of tomorrow. More than 10,000 students have taken part in their own national Sci-Tech Challenge activities. The best students from the 7 participating countries (Belgium, France, Italy, the Netherlands, Norway, Romania and the UK) will compete and present their best innovative solutions to a complex challenge designed especially for them. The European Online Sci-Tech Challenge will take place on an online platform on 21st March 2016. Students will present their best innovative solution to a Challenge designed especially for them. The jury will consist of representatives from EU institutions, business and the education community. 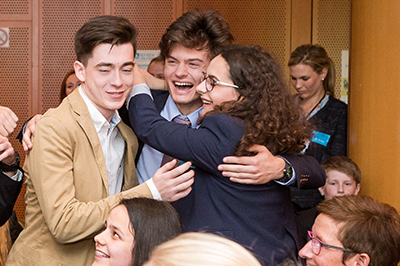 The role of the jury is to evaluate the solutions presented by students and select the best three teams to be invited to Brussels for the Grand Finale. Your engagement includes listening to students’ presentations and assessment, interacting with them via Q&A after each presentation and deliberating with the other jury members on the best 3 ideas. The European Grand Finale, will take place at the European Parliament on 10th May from 11:00 followed by a lunch.